Last November I started a new series that runs on Thursdays called, “People of Peoria.” If you haven’t seen any of them, it’s a pretty simple concept. I go somewhere, snap a photo of a random Peorian and ask five questions. One of the things I did while I was on my vacation last week was think of some new ideas for the blog and this is one of those ideas. I’m going to start going to places around Peoria and taking photos of them and rotate this every other week with the People of Peoria segment to break it up a little bit. 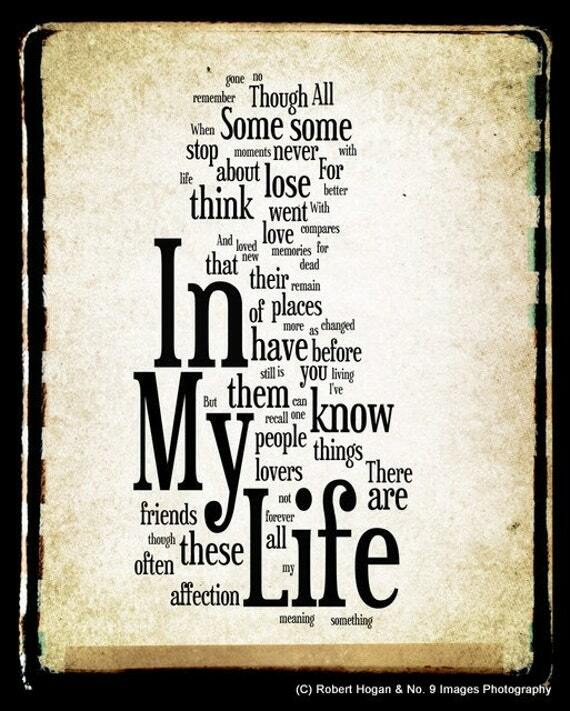 Some places will have an historical background to them and others will just be random places. Today’s has quite a bit of history to it so let’s not waste any more time, let’s start this brand-new spanking series! I figured that Murray Place would be a great location for the debut of this Places In Peoria series because it bills itself as a place in the title! We’ll take a look at the building in a minute, but first let’s pay tribute to a couple of Peorian's who are responsible for this place to exist. 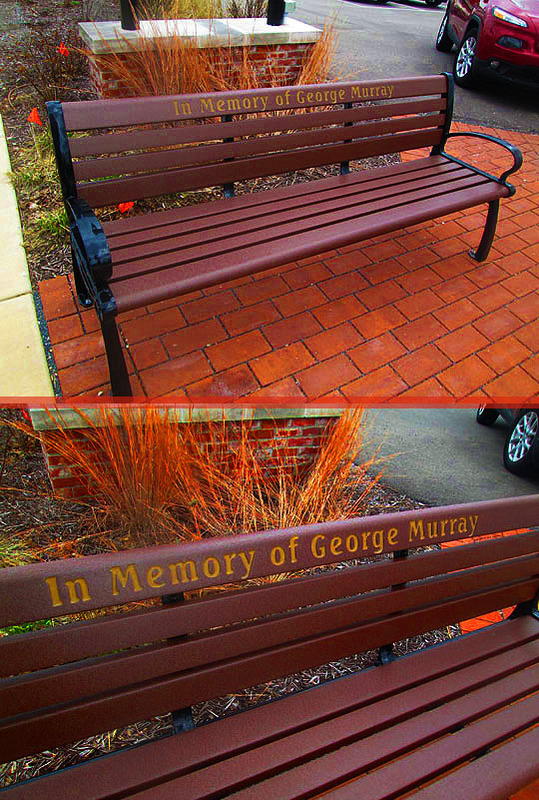 The first tribute is this bench in front of the parking lot which is dedicated to George Murray who leased the first floor back in 1947 and started a tire company. In 1971 the Murray family bought the building and it transformed into Peoria Suppliers and then it became Murray’s Jewelers and Distributors. You can read about the history and hear third generation owner Brian Murray tell the history of this building by clicking here. The next tribute is smack-dab in front of the building and it’s part of Peoria’s Sculpture Walk. It’s a wire sculpture by Jeff Best and this presentation is dedicated to George Murray, Jr. who took over the family business from his father and was a big supporter of the arts and artists here in Peoria. The building was an art center for years before the opportunity came along to commercially develop it into what it is today. It currently houses the John S. Rhodell Brewery, The Farnsworth Group, Aristo Properties Group and a floor of one and two bedroom apartments. The Murray family maintains the majority ownership of this property so it remains a local, family-owned Peoria property and business. Here’s a few shots of this iconic Peoria building. I love how they’ve kept the ghosted Murray’s signage on the brick wall. I worked here in the early ‘80’s and had a lot of fun back in those days! I spent equal time at Murray's and Ike And Swannie's across the street, which was the official Murray's employee watering hole! Right now I'm thinking about the night Marilyn Perry, Barb Espidal and I stole the pool balls from the pool table in there! There’s always a lot of memories for me when I look at this building and see the Murray’s logo there. Here’s another angle of the building and there’s the John S. Rhodell brewery which moved in here a couple of years ago. And there’s more ghosted signage at the top of the building over here, I love that! As usual I didn’t call in advance to see if we could get any shots inside of the place as I prefer to just barge in unannounced and see what happens, so let’s go forth and barge right on in! I barged in and met Tom from property management and he not only said I could take pictures, he said he’d give me a little tour of the place, very nice! Thanks Tom! This is the front foyer and for historical purposes they’ve kept the old freight elevator and stairwell intact. There is a brand new elevator in here as well and we took that upwards. The second floor is leased to the Farnsworth Group and I didn’t take any pictures there because they were busy and I didn’t want to annoy anyone. Besides I was more interested in the third floor where the apartments are and here we are! I love the window and the view and they’ve kept the original hardwood floor here. That door leads to the old Murray’s office space and Tom said they may have an exhibit in here featuring photos and history of the building. That would be cool and I hope it happens! Tom led me to one of the apartment spaces and it's very nice! The windows and view are fabulous and check out the hardwood floors and state of the art kitchen! If you’d like information about renting a space here for personal living or commercial office space, click here for residential and here for commercial. Tom saved the best for last, the roof top leisure deck! If you live here you can come up and enjoy a drink or seven and enjoy a scenic view of downtown Peoria! Thanks to Tom for giving us a fun tour on this debut post for this series and thanks to the Murray family for keeping a wonderful building filled with memories alive in downtown Peoria! Related Post: Artists At The Murray Center For The Arts.